This magnificent one of a kind art measuring 32″X 38 ” on canvas is an Archival Digital Fine Art of the original that I hand painted with layers of acrylic paint and oil paint then surrounded this beautiful composition with a silver semi-gloss frame. This work of Art was then varnished with an archival vanish to protect this art. A definite eye catching design perfect as a focal point for any room. A Certificate of Authenticity accompanies this work of art. My site is all about personal attention to my clients. If this or any other art I create interests you contact me directly. I love the light pink tones with fuchsia since those are my favorite colors. In order to build these colors with pastels I used a very intricate layering process that uses at least 20 layers of pastel. This technique gives the colors the richness and density you see in the original pastel painting and this Archival Digital Fine Art I created. Before I painted the original “Wandering Impatiens” I created a pencil sketch to scale. This was the blue print for the original pastel painting. After four months of painting I noticed that I could turn this art any direction and the composition will look great. My signature on the lower right side is the correct view for this painting. 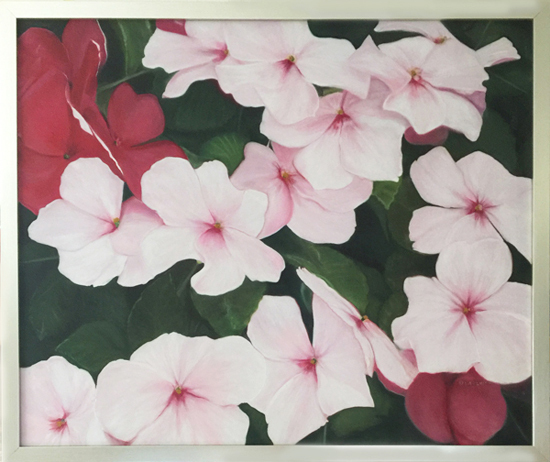 The Original Framed Pastel Painting 55″ X 47″, shows the flowers twisting and turning with the suns goodness always looking fresh and exciting. The painting is bursts with color. 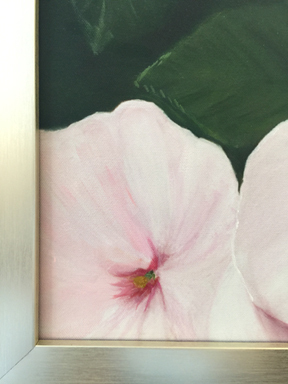 This beautiful striking Archival Digital Fine Art “Wandering Impatiens” Silver frame that is semi-matte giving this 32″X 38″ its one of a kind status. I have heavily hand painted with layers of acrylic paint and touches of oil paint to give this art its unique look. The Pink, White, Fushia and Green combination of colors gives this unique and one of a kind art a splash of color as a focal point for any room. Then varnished with an Archival varnish for lasting protecting. The excitement of the flowers whirling in different direction holds your attention to the splendor of the composition. Contact me with any questions. I would be delighted to talk more about this beautiful reflection of Nature.